The Houston Astros came into the offseason with bolstering the bullpen in mind. They have done just that, but still have work to do. Early during the offseason, the Astros signed Peter Moylan to a minor league contract with an invite to Spring Training. Just before the Winter Meetings, they added Chad Qualls, who will make a nice addition to the back end of the bullpen. During the Winter Meetings, they traded their first round pick in the Rule 5 draft for Anthony Bass from the San Diego Padres, who could pitch out of the pen or the rotation. 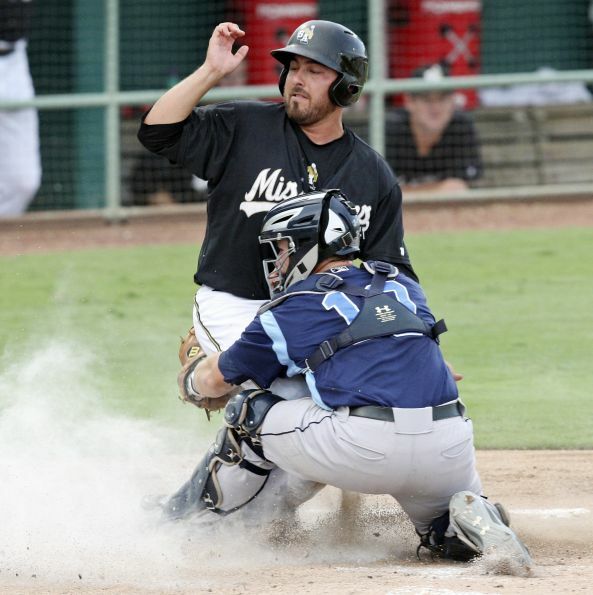 Earlier today, Monday the 16th, the Astros signed Matt Albers. If you’re keeping tabs, that’s the second reliever from the 2007 the Astros have signed this offseason. The Astros brought Albers back, not because he is from Houston, though he is, or because he has Houston ties, but because he fits the mold that General Manager wants his pitchers to have. Albers had a pretty extreme ground ball percentage (GB%) last season (63.8%), and we all know Luhnow loves those ground ball pitchers. In fact, lets take a look at the recent acquisitions and their GB% based on last season’s stats. Scott Feldman’s GB% last year 49.6%, Anthony Bass’ GB% was 45%, Chad Qualls’ GB% was 63.3%. In Peter Moylan’s last full season, 2010, his GB% was 67.8%. Given that the Astros are actually spending real money this offseason, I don’t think the Astros are finished signing relievers. In fact, I think the next pitcher the Astros sign is a familiar name in Jose Veras. Veras, as most of know, was apart of the Astros before they traded him to the Detroit Tigers. During the Winter Meeting, the hot rumor surrounding Jose Veras was that he wanted to return to Houston. In fact, they were discussing a contract, but I haven’t heard anything more than that. I, for one, hope the Astros have continued talks with Veras and end up bringing him back. The Houston Astros haven’t been all that busy the past few years in the offseason. They’ve signed older veterans to get them through the year. Last year’s offseason acquisitions included Jose Veras, Carlos Pena, and Rick Ankiel. However, this year, they’re actually spending real money. 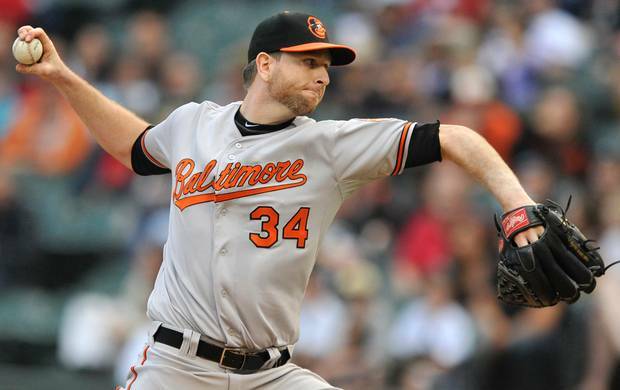 They’ve traded for Dexter Fowler, and they’ve signed Scott Feldman to a three year, 30 million dollar contract. They also brought in a former Astro Chad Qualls at two years 6 million dollars with an option for a third year at 3.5 million dollars. Those acquisitions could just be the tip of the iceberg for the Astros as the head into the Winter Meetings. According to Brian McTaggart, the Astros are still in the market to add another reliever, as well as a middle of the order bat. Whether the Astros would trade for those guys is beyond me. I don’t think the Astros the spend millions of dollars, but they’re suggesting that they’re staying on track to raise the payroll up to 60 million dollars this year, and they’re not there yet. Out of the relievers that are available in free agency, I would love for the Astros to take a look into Andrew Bailey, though he may be out of their price range. Another guy I would love for the Astros to sign would be Jose Veras. Veras was a big piece of the Astros bullpen last year, seeing as how they blew 10 saves in the month of August after he was traded, and 29 as a whole throughout the season. 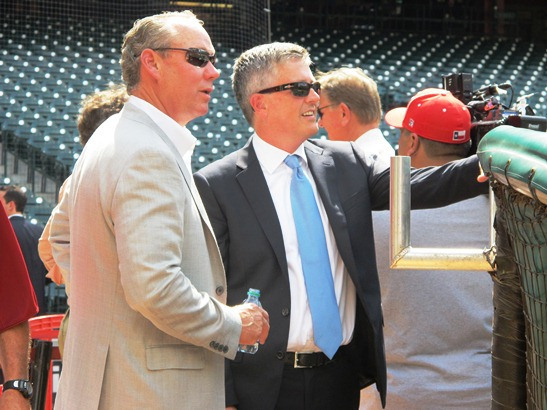 Where things get a little weird is the Astros acquiring a “middle of the order” bat. There aren’t many on the free agent market unless you include Corey Hart, who would potentially hit 5th or 6th. However, the Phillies just made Dominic Brown available. If you remember correctly, the Astros tried to acquire Brown last season, and they may pick talks back up, but I’m not sure how big a possibility that is. Nothing is imminent involving the Astros, but one can only imagine that they’ll be active in the market during the Winter Meetings. We’ll see were this leads, and as always, we’ll keep you updated if anything happens. Feldman isn’t a high profile signing, but he certainly makes the Astros better today than they were yesterday. He isn’t going to change this franchise, but he certainly adds some wins to the Astros this year. Last year with the Chicago Cubs and the Baltimore Orioles, Feldman went 12-12 with a 3.86 ERA. According to Steamer, a FanGraphs projector, projects that Feldman will go 12-11 with a 3.91 ERA. His FIP (fielding independent pitching), which measures what a pitcher’s ERA would be if the performance on balls in play were league average, is projected to be 3.67. Oliver, another FanGraphs projection, projected Feldman to finish with a record of 10-8, an ERA of 3.61, and a FIP of 3.97. Oliver projects his WAR (wins above replacement) to be 1.6, while Steamer projects his WAR to be 2.6. The more I think about this trade, the more I like. Feldman’s strikeout to walk ratio is creeping up to about 3/1. Feldman isn’t the most spectacular signing, but he is effective. He eats innings, he gets groundballs, he doesn’t walk many. Overall, this signing isn’t a spectacular deal for the Astros, but it is a decent one. Shout out to Ryan Dunsmore (@d_more55 on twitter) of the Crawfish Boxes for photoshopping Dexter Fowler into an Astros uniform. The Houston Astros have been saying all off season that they would make changes to the roster. Like most people, I didn’t really expect much. The Astros started off by signing Peter Moylan to a minor league contract with an invite to Spring Training. That was the type of move I was expecting the Astros to make. However, two days ago, the Astros shocked me, as well as many others, when they traded for the Colorado Rockies’ center fielder, Dexter Fowler. The Astros traded starting pitcher Jordan Lyles and outfielder Brandon Barnes for Colorado’s Dexter Fowler and a PTBNL. As far as this trade goes, my initial reaction was excitement. The Astros fleeced the Rockies, at least in my mind. As most of you know, I’m a huge fan of Jordan Lyles. I have thought that he could turn it around in Houston. I still feel he can turn it around, but I’m not sure Houston was the place. Not sure how well Colorado will treat him either. I waited a few days before I wrote this article, mainly because had I wrote it three days ago when this trade went down, there would have been a lot of excitement and loud noises. I’m pumped for this trade. You should be too. 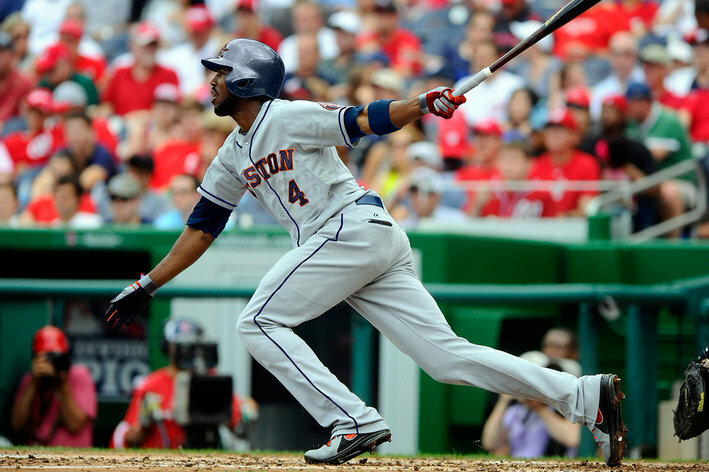 Dexter Fowler is a very nice asset for the Astros. Over the course of 162 games, Fowler will give you a slash line of about .270/.365/.423. He’ll average around 15 home runs per year, as well as 20 stolen bases. A lot has been made of Fowler’s defensive “woes.” I’m not exactly sure why. As far as fielding percentage goes, Fowler has a fielding percentage of .986 over his six year career. While we watched Brandon Barnes make spectacular diving catches in center field, for what seemed like all season long, his fielding percentage wasn’t much better than Fowler at .989. Many people have had their very on reaction to this trade. Since the smoke has cleared, Richard and I have discussed this trade, and will give you our reactions to this trade not that our excitement level has gone down a bit. First off, what was your initial reaction to the trade? Richard Perez (RP): As with any trade where one of the most likable players are involved, I was extremely disappointed to know that two of our very likable players were gone. I was more upset that Brandon Barnes was out, but with acquisition of Fowler, it was a little easier to take. As far as receiving Dexter Fowler, I was also surprised that Colorado would be willing to give up somebody like that. In my opinion, Fowler is one of the better lead off hitters in the game, on of my favorites along with Shin-Soo Choo. Lee White (Me): As mentioned earlier, I’m disappointed in the fact that the Astros no longer have Jordan Lyles. At age 23, he still has a ton of time to grow. He has solid stuff, but couldn’t figure it out. Due to the fact that he was rushed, I think his mindset may have changed. Houston just wasn’t right for him, but I’m not sure Colorado is either. As far as acquiring Fowler, I was pumped. Still am. The Astros traded a fourth outfielder and an under-performing starting pitcher for Fowler and a PTBNL. My favorite part of this trade is the fact that the Astros finally have their true lead off bat. Realistically, what expectations do you have for the Astros’ new center fielder? RP: Speed. Lots of it. I know Barnes was very well versed out in center, I just hope Fowler can learn how to play the unusual center field of Minute Maid Park. In my mind, I thought back to when Willy Tavares was Houston’s speedy center fielder. I expect good things to come of Fowler. Me: Realistically? I expect him to get on base, and once he is on there, the Astros will send him in motion. Fowler is the type of player, in my mind, who will be pretty balanced. He isn’t going to hit for an extremely high average, isn’t going to crush long balls all day everyday, but he will certainly hit for an average around .260-.265, probably 10-15 home runs, and 20 stolen bases. He could possibly rack up more stolen bases, just depends on if the Astros put him in motion as much as I would. In terms of statistical numbers, do you think his home run numbers were inflated by the high altitude of Coors Field? RP: Everybody says numbers are inflated in Coors Field, but I tend to not believe that, especially in this case. If you look at his home run numbers of the last three years, he only had 30 total home runs. However, his extra base hits are his best statistic. I’d say his speed is more to thank than the thin air in Denver. Me: Saying his numbers may have been inflated by high altitude in Colorado bugs me. They weren’t. Not to mention, Minute Maid Park can be a bit of a boom box too. As Richard says, it’s not as if he was hitting 30 home runs a year. If he were, it might be a different story, but I expect Fowler to hit around 15 home runs in the upcoming season. If you had to guess, what would be the next move that the Astros make, and will it be a free agent signing or another trade? RP: Given the circumstances, I’d say the Astros trade one of their outfielders, possibly JD Martinez if he doesn’t get taken in the Rule 5 Draft. I’m not sure where he would get shipped, but I’d say that a trade is more likely than a free agent signing, and it could happen before the Winter Meetings on the 12th. Me: With the signing of Scott Feldman today, and the Dexter Fowler trade three days ago, I think the Astros sign their next player. Preferably a relief pitcher. Maybe a return of The V, Jose Veras, in Houston? There are also a couple players he weren’t tendered contracts that the Astros could make a run, and those include Andrew Bailey and John Axford. Either of those would be nice in Houston. As for the Scott Feldman signing, we’ll have another post on that up sometime later today. Another special thanks to Ryan Dunsmore of The Crawfish Boxes for his awesome photoshop skills. Richard and Lee discuss the recent sweep of the Mariners, Jarred Cosart being shut down, and discuss the recent upswing late in the season. Follow us on Twitter, “like” us on Facebook, and leave us comments below! Alex, Lee, and Richard sit down to discuss Paul Clemens’ start on Tuesday, David Martinez, the slumps of Jose Altuve, Chris Carters’ struggles, and the signing of Leo Heras and Jophet Amador.